First with some housekeeping: I have bought my own domain name. I am moving from http://letshaveacocktail.blogspot.com to http://www.letshaveacocktail.com/. Please update your bookmarks or readers. For those of my fine bloggy friends who have me listed on your blogrolls, I have been advised to ask you to update the link. The transition should be final in the next few days. Everyone who uses the blogspot address will be rerouted when the transition is final but it will not update your blogrolls. Sorry for the chore! Now, for the good stuff. I love to come across a laudable article that weighs against most of the austere components that make up your average daily news. 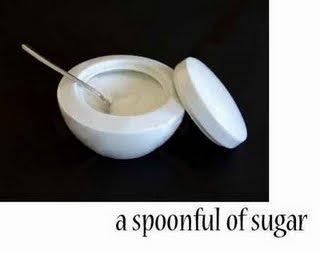 Sometimes a spoonful of such sugar is exactly what we need. I read an article from the Vail Daily News about a cancer survivor who opted to fund a support dog for another cancer victim. What makes this article even more compelling is the cancer survivor is only 9 years old. The second cancer patient is only 2 years old. After two years of surgery, chemotherapy and treatment for a brain tumor, 9-year-old Allison Winn wanted other kids with cancer to have a companion dog like hers. So when she regained her strength,Allison initiated a fundraising campaign to pay for feeding and training of companion dogs for other kids diagnosed with cancer. Allison's idea was to bake homemade dog biscuits and sell them by the thousands at a lemonade stand in front of her house or a store. At the same time Allison was baking dog biscuits, Shanell Mullen, began noticing odd behavior in her daughter. When they went in to have her eyesight checked, other signs led them to an oncologist. Diagnosis: brain cancer. This tiny girl had a tumor the size of a golf ball removed this past summer. And recently, Allison watched as 2-year-old cancer survivor Krysta caressed the nose of Lucky Bug, a gentle black Labrador, her new companion dog. Allison earned about $1,000 over the summer, enough to buy Lucky Bug and two other dogs she can give to other cancer-stricken kids. She's also planning a new dog biscuit-making campaign. I love that children can learn compassion, and kindness, and philanthropy at this young age. I can't imagine what a parent would experience hearing their child has cancer, and I hope I never do. Bravo to you Allison for demonstrating what it is like to be graceful and loving in spite of your own adverse circumstances. Love your giant heart. It was more than a spoonful of sugar or me. Lately my friends and family have been clobbered by the wicked C, zapping the wind from my sails. This morning,I'm treasuring this single moment when I've been once again able to sail along effortlessly. Thanks, Allison; I don't know you, but I love you beyond words. It is this story retold a hundred different ways played out in a thousand different communities that actually give this ranting old cynic some hope. What a wonderful way give to others--thanks for sharing. It's wonderful to hear that stories like that are in the news! What an amazing little girl. This is fantastic. Combined with the one I put up yesterday and the one Travis put up earlier in the week, I have hope that the future won't be quite so dark. This is a beautiful story. I just love how small children have a way of seeing through all the crap in life and can focus on the important stuff. It is when we get older and 'tainted' that this sometimes gets harder. congrats on your domain name!! Children are amazing. Allison, you ROCK! That's a really awesome story :) Thank you for sharing it!! Allison is obviously an angel on earth. Bless her heart. Allison is an amazing source of inspiration! Thank you for sharing. I just had to tweet it. What an inspiration! Wonderful old soul wrapped up in that darling little girl. Thanks for sharing. What a wonderful tale. there is hope after all. PS. Can I ask you why you've moved away from blogspot? The renewal for my site name is up again and am thinking of doing the same but can't see the benefits. Or am I having another blonde moment? Kids like this give you hope for the next generation. Thanks for posting a positive, uplifting story. It seems everyone around me lately is Debbie Downer and Cathy Complainer. We need to realize how good we have it! you'll be so much happier on your own domain, but are you moving to your own host, or keeping it where it is? Children are so compassionate. What a touching story. Beautiful little girl - inside and out - and I hope she grows up to live a full, healthy and happy life. What an amazing little girl! That's the kind of news I like to hear. Amazing what we can learn from children, isn't it? Yes, BRAVO!!! I love that story, kids are so full of what we all need. Thanks for a warm start to such a chilly morning. Seeing so many self-absorbed, ungrateful kids daily (yes, I mean mine...) it warms my heart to hear about a child doing for another. And in such a huge way! Sometimes kids show us adults how to be truly giving. In our world now of educating children all the same way, I absolutely love hearing stories like this of being an entrepreneur and a doer. I am blessed to know a four-year-old boy who is currently battling stage 4 neuroblastoma (a severe form of child cancer). He is the same way. He is so upbeat, always smiling, rarely complaining, a fantastic big brother to his newborn sibling and an inspiration to all who know him. He is learning some very adult lessons way too early in life, but he is managing it with such grace and bravery. For some reason, I think God strengthens children burdened with such pain; it's almost like they become little angels on earth. This little girl is the perfect example of that, and she is spreading it to all her know her, as well as that two-year-old and everyone who knows him. I love to hear stories like this they are so inspiring they really open up my thinking to "what is possible". If a kid can _______ then what can I do? If somone with so little can do _____ and I have been so blessed what can I do? If the campaign is done online by all means please let me know. what a truly uplifting story. Just what the world needs now. Every morning, before I turn on CNN or Bloomberg, I read JennyMac. Congratulations on your move/new domain name! I will change your URL on my blogroll! What a truly generous spirit she has! I love when Ellen has children like that on her show! I come here to read stories just like this :) - and the one below. Good stuff. That touches my heart and warms my soul! We could use a million more Allison's in this world! I wish as children grow into adults that they would take the heart they once had to forgive easy,love easy,make friends with anyone. As adults we tend to let all that go. As for me I try to still be that way and many think it so odd.Its a shame. I teach my daughter to do the same. Love this story, amazing for a young child to give soo much. What a wonderful story! Thanks for sharing. And congratulations on your new domain name! I love the unconditional kindness in a childs heart. This story just warms my heart. I am so happy to be reading your post again! I have missed you Jenny Mac! I will most def be updating you on my blog roll lady!! Aww, how sweet is she??? If only every kid could be like her! I love it - and oh yeah...clicking a few times and copying and pasting. May goodness, peace and happiness forever shine upon this sweet angel! That actually warmed my cold evil heart! Best story of the DAY! That is so heart warming! Very sweet story. I'll be following you where ever you go, JennyMac! This is a heart warming story. It is inspirational that someone so young can be so selfless. Stories like this melt your heart. Faith in humanity restored. If she ever gets a website, I want that address! I will update the ol' blogroll. That beautiful story warms my Grinchy heart. And now I am crying. Darn you, JennyMac, darn you ... what a touching story. (must go get tissues now). It is so humbling to read a story like this, especially at this time of year. So many people are consumed with the holidays and presents and buying, when there are people out there truly suffering yet their hearts are so big they cannot be contained. That little girl opened up the hearts of many today through reading this post. Bless her heart, indeed! What a wonderful example of what a child can do to make a difference. That is a beautiful story! Very beautiful! This is a beautiful story. Thanks for sharing!